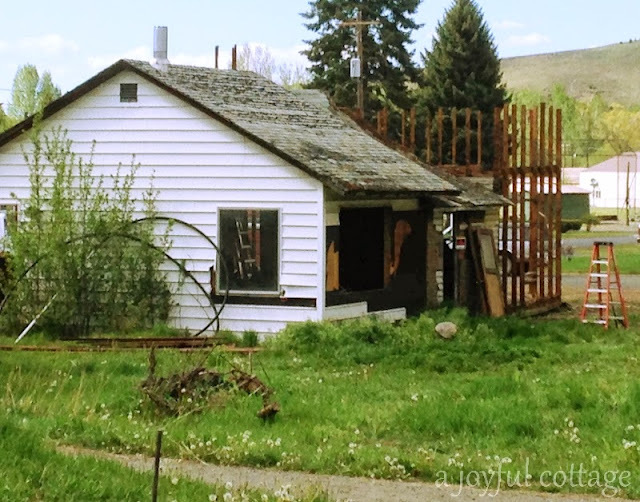 In my last update I promised to tell you more about the garden shed. The shed will double as a greenhouse with windows on three sides -- south, east, west -- and room for our lawn mower and garden tools in the northwest corner. 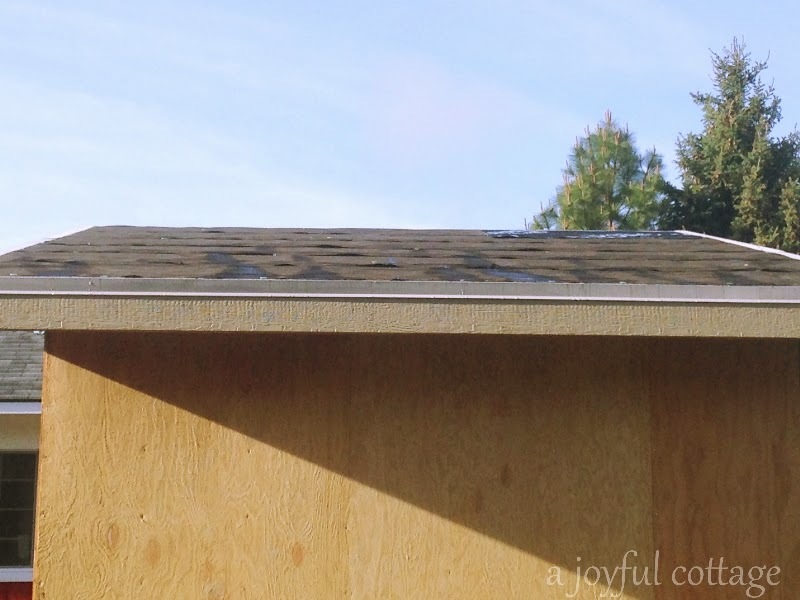 Those little openings above the windows will be covered with siding. 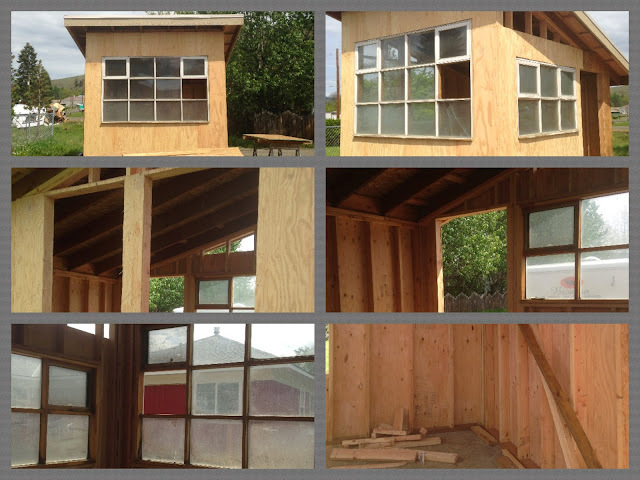 The multi-pane windows were salvaged from the house behind ours. When Dennis saw workers dismantling the house he walked over and asked what they were going to do with the windows. They said he could have them. We'll have to replace one glass pane. The upper corner windows on both sets are designed to open, and they're still operable. 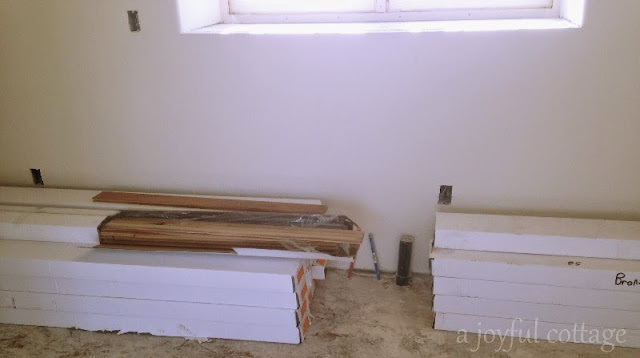 We previously scored a free door and bought large windows removed from an old farmhouse. When we were able to get these additional windows for free, Dennis redesigned the shed to accommodate them. Two of the farmhouse windows will be installed on the west side. He raised the windows to allow for plant shelves with storage underneath. The hardwood flooring is delivered. Sheathing is installed on the garden shed roof. 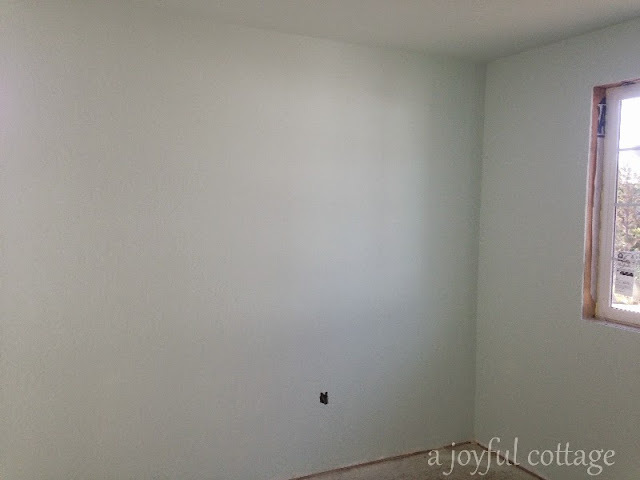 I give the bedroom a coat of paint. 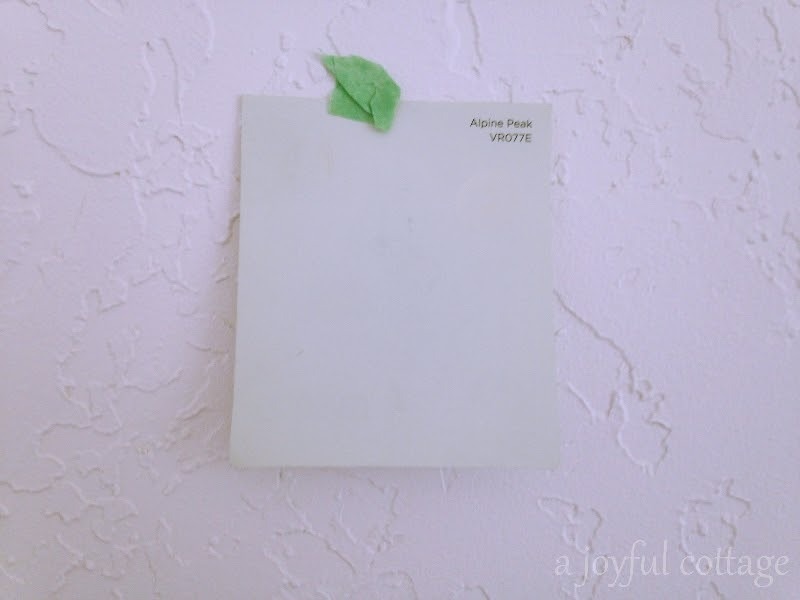 Here's the color chip - Valspar Alpine Peak - taped to the wall after one coat. It sure doesn't look like the color chip yet, does it? I don't usually have a problem picking the right colors, but for some reason this one just didn't work. On my monitor this color chip looks gray. On the bathroom wall it looks pale green. What to do? More about this later. 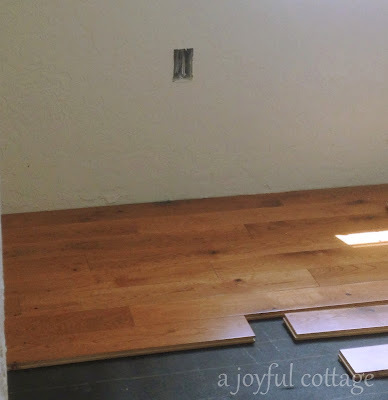 The guys start laying the hardwood flooring, beginning with my room (this is my writing/quilting/creating/dreaming space). 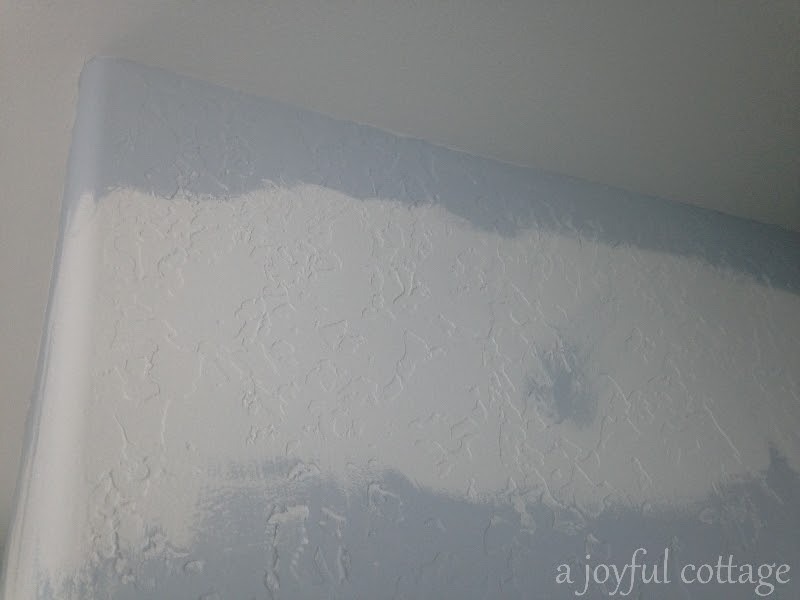 I apply the second coat of Alpine Peak to the bedroom walls and ceiling. This photo was taken at 6:00 PM. Light here is from the west and north. The green intensity changes throughout the day and into the evening. I like it. A lot. Dennis sculpts the landscape. 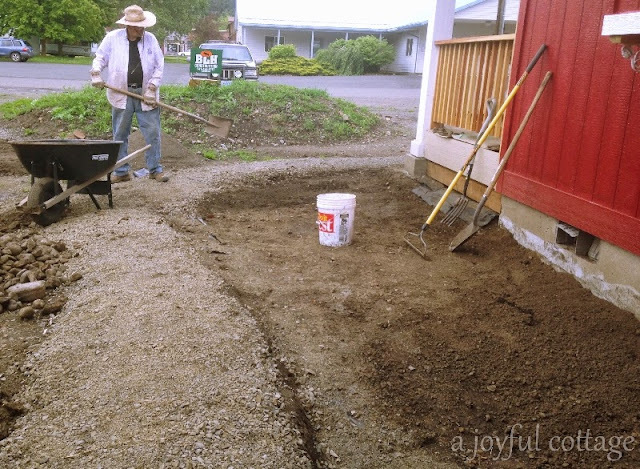 Soon top soil will be brought in to fill in the lower areas and allow for some intense flower planting. Can't wait! This guy is working so hard. I apply one coat of red paint to the front panel under the porches before the rain moves in. Dennis and I run errands. We buy paint for his studio, and another can of paint for the bathroom. 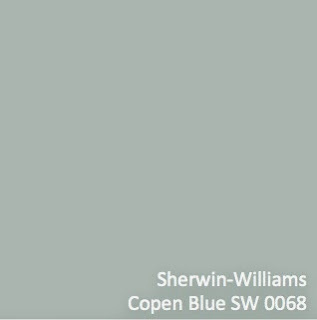 This time I'm going with Sherwin Williams Copen Blue. 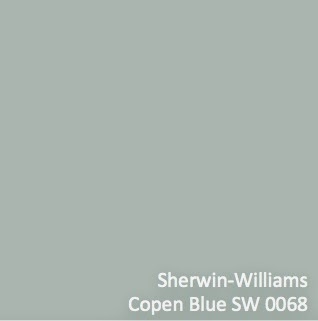 There'll be a lot of white and neutral colors in the bathroom and this color will look great. Mitch the floor installer has been dividing his time between our job and another. My room is completed. And the kitchen/dining/living room is progressing. I begin the repainting of the bathroom. Here's a photo I took just for you, to show the contrast between the French Urn and the Copen Blue. I actually like the French Urn on the ceiling with the Copen Blue walls, so I left it. Dennis is on a mission to keep critters from getting under the porches. 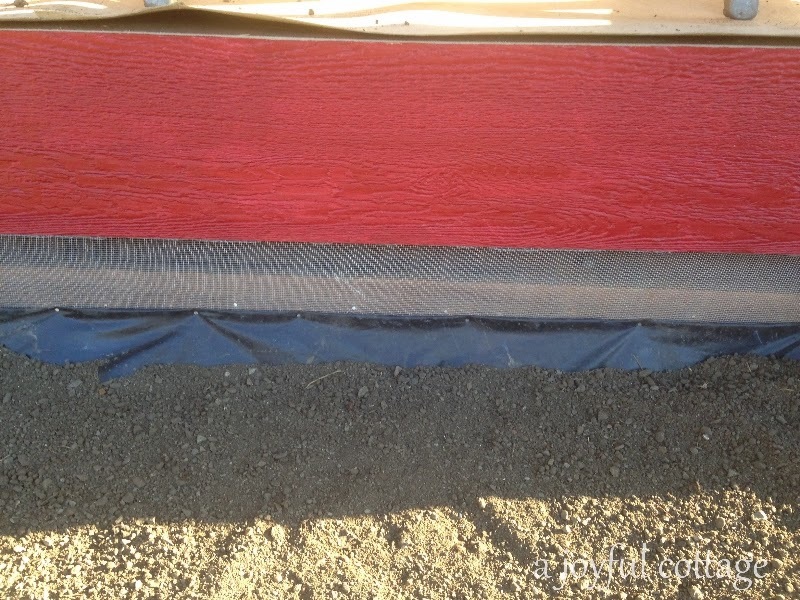 His solution is to add landscape timbers and nail screening to cover the gap. I like this because the screen won't be noticeable when all this is completed. The black plastic will be completely covered with soil, and there'll be plants and shrubs and such planted there. I get some painting done on the north exterior. Dennis starts painting his studio. He gets the ceiling completed and begins work on the walls. I step into help and we get 'er done. I love the colors Dennis chose. The ceiling is Valspar Shrouded Lace. 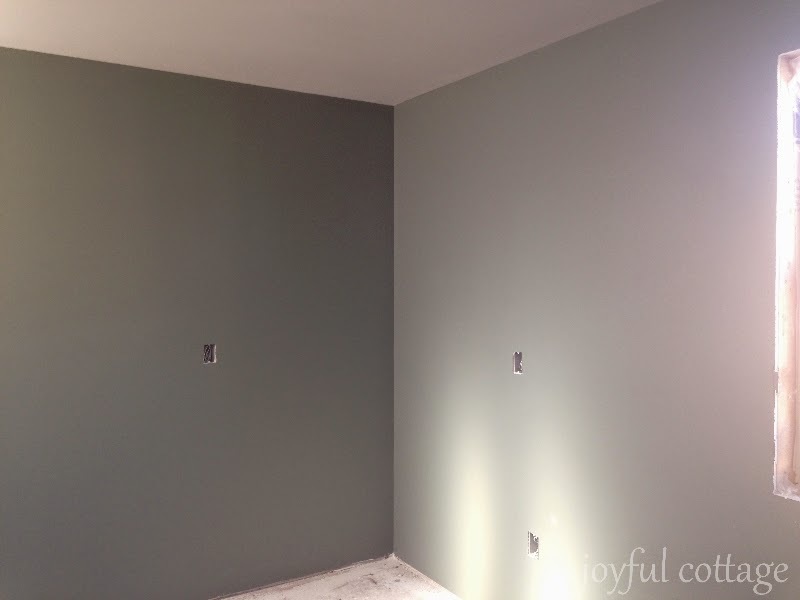 The walls are Valspar Sage Slate. 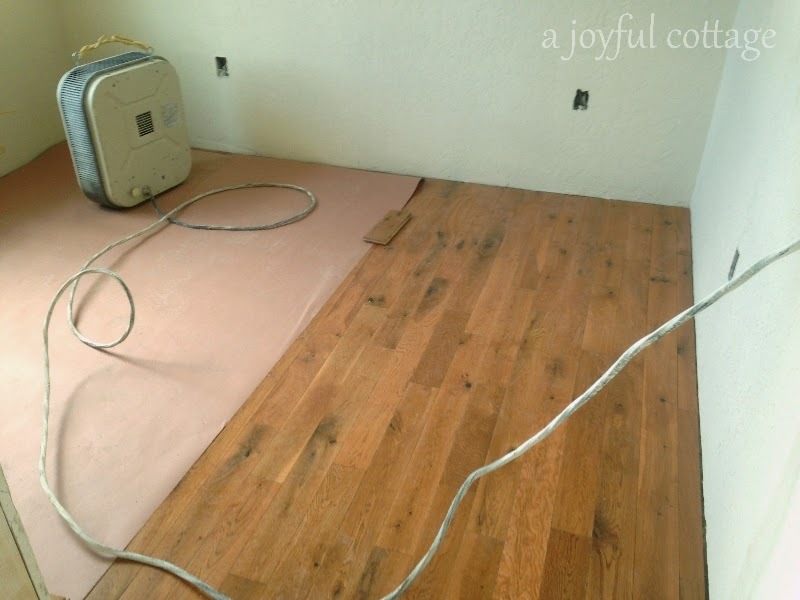 He selected a carpet in a milk chocolate color (he likes carpet under his feet in his studio. . .easier on the legs and back when standing and painting). 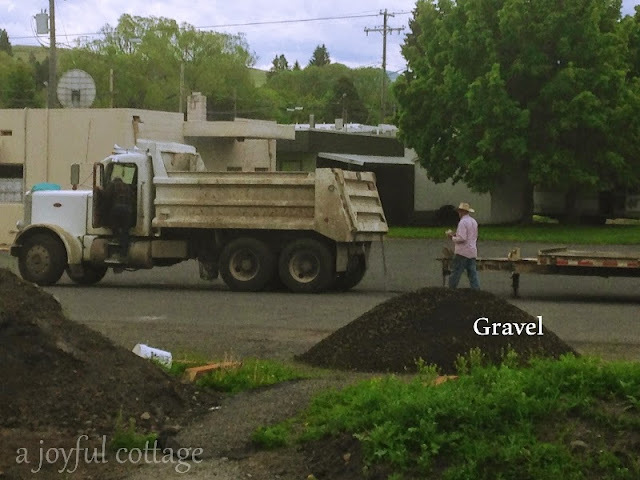 Johnny our gravel guy delivers more gravel to the site. Dean delivers the interior doors and their hardware. I love the beadboard and the arch on the door. Just the cottage look I want. 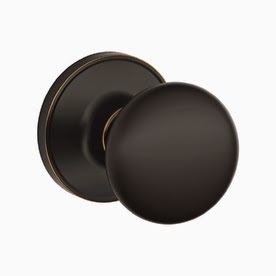 I didn't get a photo of the door knobs, but they look similar to this one. I paint the second coat on the bathroom walls. See how the incoming light changes the shade? The walls are all the same hue. I paint the hall closet where the stacked laundry will reside. The color is Natural Canvas to match the hallway. Now that I've completed the interior painting I can get back to painting the exterior. Still lots to do there! Thanks for your concern about my computer problems. Miraculously, on the morning I was all set to take my laptop to the repair shop, an automatic update to Windows 8.1 took place. It cleared up all my problems. Thank you, Lord! 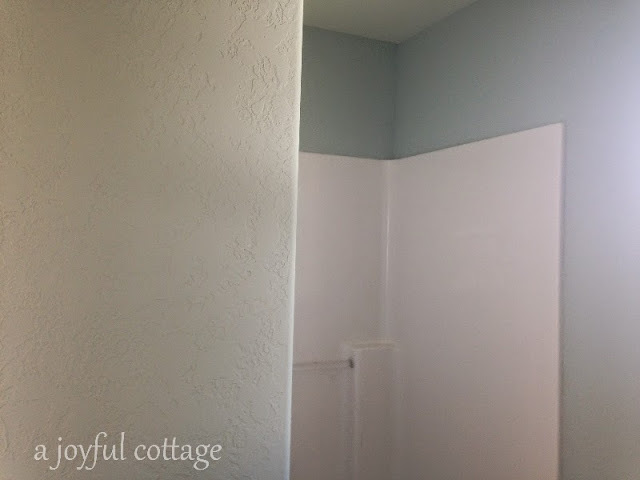 I love the colors you chose - especially the 'new' bathroom color. It's all coming together and I can't wait to see more! It won't be long before you have it all just the way you envisioned it and I'm thrilled for you. I am amazed how hard both of you are working to make your dream cottage. Very selective in color, fixtures and fitting will surely turn out to be place you love. The step by step photos are interesting and educative for me. Wow, can't believe you're installing railings already - amazing! Looks just like your rendering too; we tend to wander throughout the process a bit. Our color schemes change for one. Your red is striking too BTW. Keep at it! It looks wonderful. I like the color of the studio as well. The outside red is just great! I am loving your cottage. I just got all new doorknobs in that same colour. Everything is coming together so well - it seems a quick process to me but I bet it feels like forever to you!! Hope you're able to move in soon! Hello Nancy! My what very hard and efficient workers you two are! I love all the colors you have picked out. 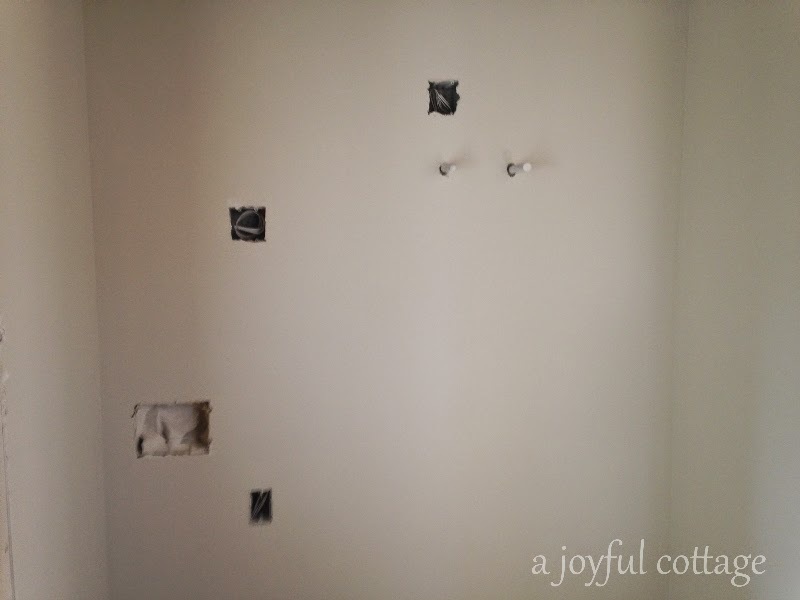 I am getting excited now, because I feel the decorating coming on...I have really enjoyed following the details of construction, but you know that's my favorite part! ;-) I'm glad your computer is up and running, but when do you have time to use it? Phew, I'm tired just reading about the work! 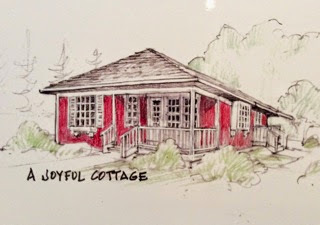 Nancy I just love your progress reports, it's exciting to see your cottage become reality from plans on paper. I really like the color paint Dennis chose for his studio and your hardwood in your room is beautiful. Paint is often nuanced and those color chips are confusing. I just switched halfway through our basement steps the first lighter grey to a warm deeper stone grey. Hi..I really like your color choices..that's a big job painting it all yourselves..and the garden shed looks Great too..can't wait to see the landscaping..wish 8.1 would fix my problems..unfortunately I think it's part of the problem..looking forward to seeing the next step to finishing your sweet little cottage..the red is looking FabuLous..
Love all your colors tweaks and trims . . . The garden house is so wonderful . . . 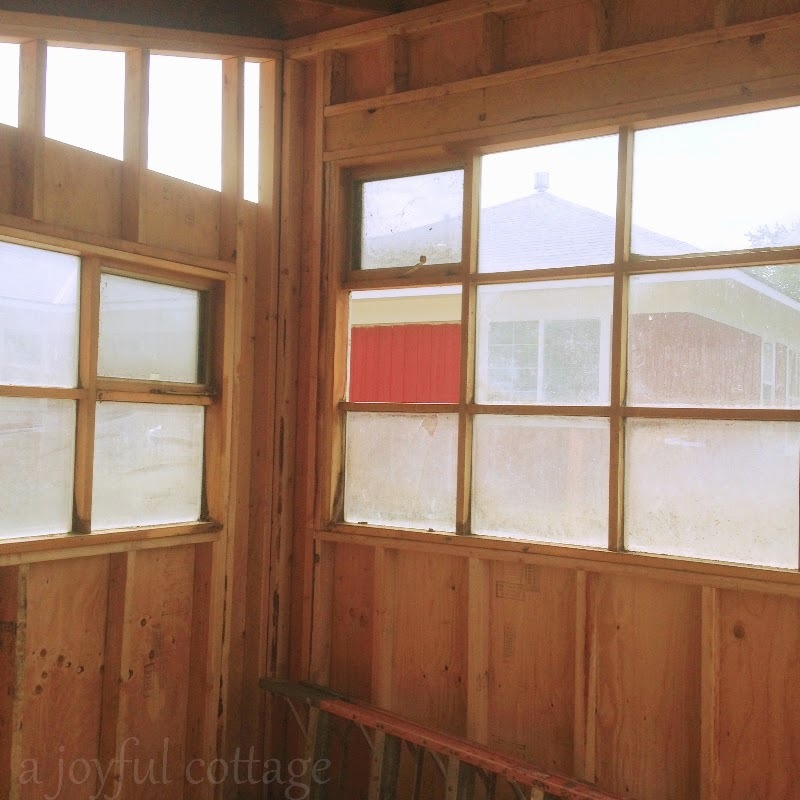 Recycled windows make it unique and all the more charming! Finish line is getting closer . . . So much progress! I love the soothing colours you've chosen for the interior. And the door is perfect! 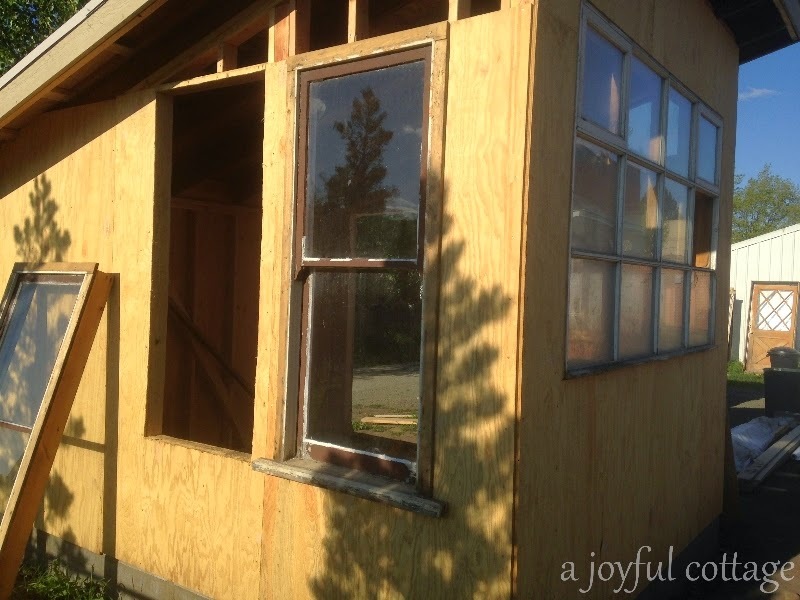 This is coming along so nicely and love the shed / windows story! Nancy, you are making such great progress on your cottage! The shed/greenhouse will be a wonderful addition. Love the colors and how it all looks so fresh! Can't wait to see the landscaping. How fun to be working with a blank canvas! 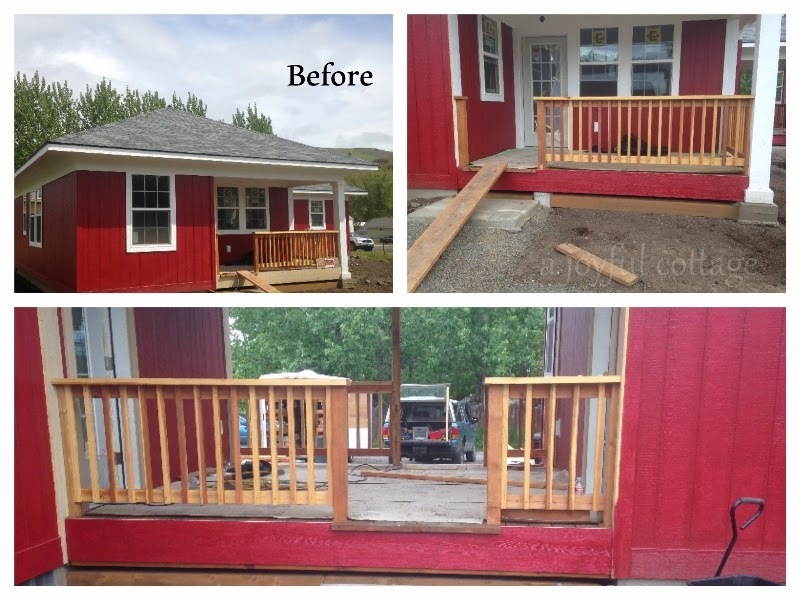 Your cottage is coming along so well, Nancy! Such fun to catch up with your progress! 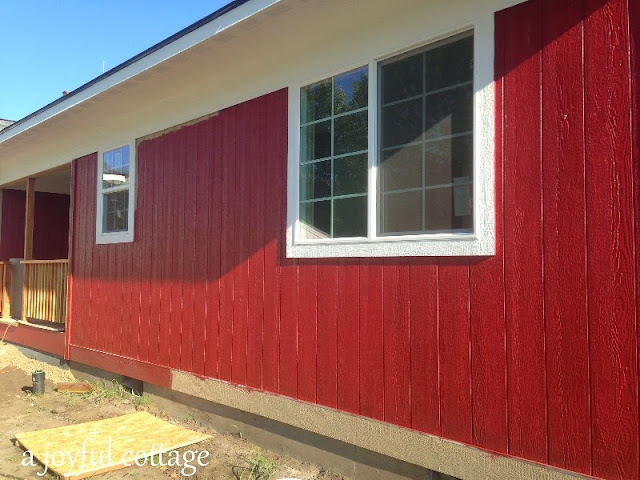 I love the red you chose for the exterior. Choosing colors is sometimes so hard. They do change so much with the changing light. That garden shed/greenhouse is going to be wonderful! 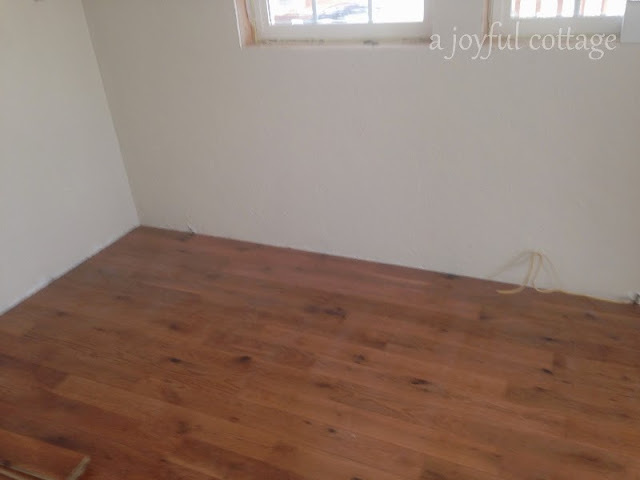 I'm loving your colour choices and the hardwood floors, it's going to be so beautiful.